Parclick gives recommendations for parking in Venice, which let you enjoy San Marco in all its splendour. 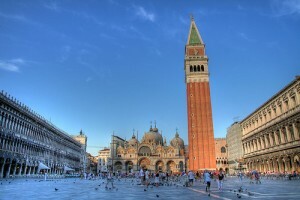 San Marco is one of the most important iconic postcards for Italy, and a visit to its beautiful Piazza cannot be missed. Both Autorimessa Comunale AVM and Garage San Marco are in Piazzale Roma, right at the entrance to Venice’s city centre, near the Passenger Terminal and the station. Following Venice’s side streets, you reach San Marco after about one and a half kilometres on foot. San Marco is the centre of Venice and is in a large area enclosed to traffic, reachable only on foot or by Venice’s public water transport. Piazza San Marco lies in the heart of Venice’s lagoon, and is one of the most fascinating drawing rooms of Italy, and one of the most visited monuments in Europe. It’s spread over a huge area that hosts numerous points of interest. The most obvious is the enormous Basilica of San Marco, the city’s cathedral, home of the patron saint, and symbol of the piazza with its famous Bell Tower of San Marco. Moreover, here you can find Torre dell'Orologio (St Mark's Clocktower) with the terrace with the Moors; the Doge’s Palace with the column of the winged lion, the Civic Museum, the huge Biblioteca Nazionale Marciana (National Library of St Mark's); the Columns of San Marco and San Todaro at one extreme of the piazza. San Marco is architecturally one of the most famous piazzas in Italy for its structure and is also called “The drawing room of Europe”. Thanks to Parclick you can book a suitable parking space where you want with a simple click. All you need to do is to click on the parking icons near where you want to be, and the map will give you the best indications to meet your needs.